Cooking is something I always wished I had more time to do. 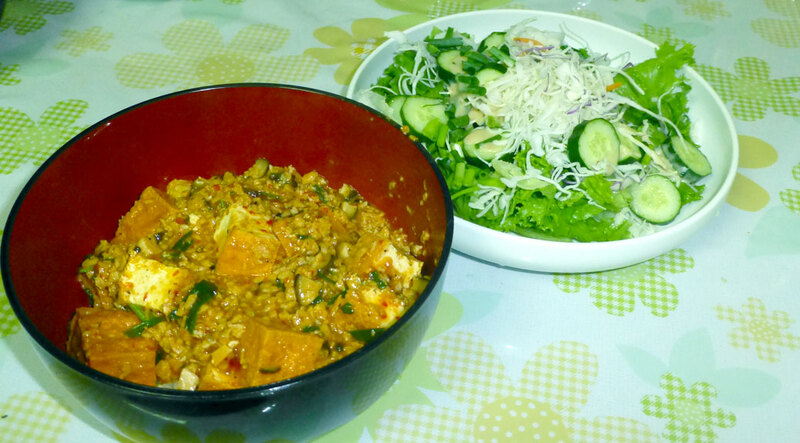 I love to collect recipes and try new things, especially modifying existing recipes to make them vegetarian-friendly. With all my free time here, I finally get to spend some time experimenting with new recipes. The first known recipe is thought to be from an Akkadian tablet circa 1600 B.C., transcribed to a clay tablet that could be passed down through the family or shared with neighbors. That clay tablet gave way to paper, index cards and eventually the internet. Still, word of mouth is a great way to get new recipe ideas. What do other people love to make? Leave a comment and maybe your idea will be the basis of a future blog post! Last night’s dinner was inspired by one of Viktoria’s students. Mapo tofu is a Chinese Sichuan recipe that gained popularity in post-war Japan as a less-spicy, sweeter interpretation. 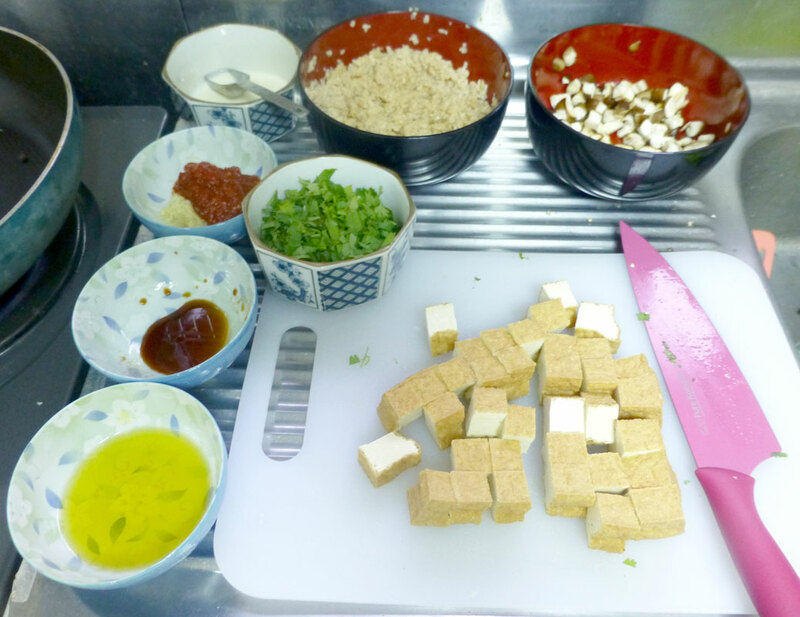 It’s as ubiquitous in Japanese homes as macaroni and cheese in the U.S., so much so that “instant mapo tofu” is available in the grocery store. Much of the flavor and rich color comes from tobanjan, a spicy chili bean sauce. Traditional mapo tofu recipes have oyster sauce and ground meat (pork or beef), so here’s a vegetarian take inspired by this recipe from Viet World Kitchen. Note: When I make stir-fry recipes, I like to prepare the ingredients in advance, especially when using a wok. These recipes cook fast, so there’s not a lot of time to chop, measure and mix along the way. Put the textured soy protein in a bowl and cover with boiling water. Let sit for 10-15 minutes until tender, then drain the water in a colander or strainer. Mix 3/4 teaspoon of soy sauce into the drained textured soy protein. Reserve 1 1/3 cup of boiled water for making the sauce. Finely chop the shitake mushrooms and mix in 3/4 teaspoon of soy sauce. In a frying pan, toast the whole peppercorns over medium heat until fragrant. Let cool slightly and grind roughly with a spice grinder or pestle/mortar. Mix 1 teaspoon of sugar with 1 teaspoon of soy sauce. Grate/microplane about 1 teaspoon of fresh ginger. Combine with 3 tablespoons of tobanjan sauce. Dilute 1 tablespoon of flour or cornstarch with three tablespoons of water. Slice 2-3 green onions on a diagonal cut. In a wok or skillet, heat 2 tablespoons of oil over medium heat. Add the chopped mushrooms and textured soy protein to the pan and sauté for about a minute until mushrooms start to cook down. Add the ginger and tobanjan. Mix continuously until combined. The mixture should now have a deep red appearance. Add in the sugar/soy sauce mixture and stir to combine. Add the tofu and stir to combine. Add the 1 1/3 cup of reserved water to the pan and bring to a rolling simmer. Cook for about 3 minutes to allow flavors to meld. Taste the sauce and add more sugar as desired. Add the green onion to the pan and combine. Stir in the flour/cornstarch mixture and simmer until the sauce begins to thicken. Stir in the ground peppercorns, remove from heat and let sit for about five minutes before serving. Hah, this dish always exasperates me when I find it in a Chinese restaurant in Japan. Why would they put pork in a tofu dish Shen the point of tofu is to have at least just one dish for vegetarians on the menu? Preposterous! I recently ordered vegetarian taco rice at a restaurant… it was covered in ground beef. For a country with such a rich vegan past, it sure misses the mark on veg-friendly cuisine these days.